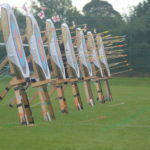 Bowmen of Adel | We are a friendly archery club located at the Adel War Memorial Association in Adel, North Leeds (England). 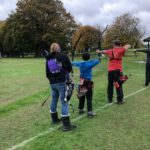 | Page 2 Bowmen of Adel – Page 2 – We are a friendly archery club located at the Adel War Memorial Association in Adel, North Leeds (England). 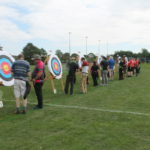 We are a friendly archery club located at the Adel War Memorial Association in Adel, North Leeds (England). Saturday morning dawned wet and windy. So wet and windy, in fact, that most archers opted for the dry safety of home, rather than venture out onto the field to contest the “Chip and Pin”. So few new members were there in fact that the trophies were won without a shot being loosed. We now paused for the consumption of bacon butties (provided by Roger) and ample tea, coffee, cakes and biscuits. We do love our food. There was yet more to do. As there were not enough inexperienced archers to make the usual “Pro/Am” teams, we decided to simply draw pairs and decide the winners on handicap. The results were over the whole round, which was a Short Metric III (or IV if you were Vish and Bradley), incorporating the scores from the earlier Frostbite bit. On September 9th, a formidable group of longbowmen, under the watchful eye of Keith Shooter, gathered at the club to shoot the 40th “Bowmen of Wharfedale” longbow tournament. The round was a 2-way Western, under BLBS rules – so no sights or sighters. It is remarkable to anyone not versed in the way of the longbow how anyone manages to hit the target at all (though not all arrows did). Conditions were not perfect, with little sunshine, scurries of rain and a gusting breeze, but the archers cheerfully shot on. Lunchtime saw them provided with pie and peas and fruit tart, all of which drew compliments from many. Lunchtime also saw the only prolonged period of breezeless sun, and the morning conditions returned to welcome the archers back. The club had many members participating. Not least Carol Wood, who briefly left slaving in the kitchens behind to serve elegantly as Lady Paramount. We also had two awards – Steffi Hermanski took the prize for Ladies – Most Hits, while Alex Hermanski was delighted to receive the “Do it yourself longbow kit” for most greens. A surprise award was made at the end, as the BLBS presented David Aikin with an engraved tankard for organising the tournament these many years, and keeping the flame of BLBS archery alive. Well-deserved indeed! Next year’s tournament is booked for September 8th – get your entries in now! Photos of the day’s events can be found here. Great weather, great company and some good shooting too, what more could you ask for the first weekend in September. I’d like to thank everyone involved with making the day such a success. All those members who came to help out be it for half an hour to all day. As they say, every little helps and was greatly appreciated. Louise, thank you for being Judge and Nicky for accepting the role of Lady Paramount. Also thanks to all our own club members who took part in the actual tournament as without the boost in numbers we were very close to calling the day off. We even won some stuff too so congratulations. For a few of you, I know it was your first time in a “proper” tournament so well done to you all. If you enjoyed the day tell your club mates and bring them along next year. Photos from the day can be found here. Subscribe to get the latest posts direct to your inbox.